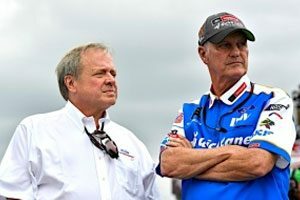 For Eddie Wood, there are two ways of looking at his team’s status headed into this weekend’s Can-Am 500, the final race of the Monster Energy Cup playoffs Round of Eight. On one hand, it’s a “must-win” race if Ryan Blaney and the No. 21 team want to advance to the final round of the playoffs and compete for the Cup title in Ford Championship Weekend at Homestead Miami-Speedway. It is possible for Blaney to get a berth in the title round without a Phoenix win, but it would take a combination of a great finish by Blaney and poor finishes by the other five playoff contenders not already assured of advancing. On the other hand, it’s a “can’t lose” time for the team, as Blaney and the crew can celebrate a fantastic season no matter how they finish at Phoenix. With three drivers – Kevin Harvick, Kyle Busch and Martin Truex Jr. – already assured of being in the elite four on Ford Championship weekend, there’s only one spot left and Blaney is sixth in the standings, 22 points below the cut-off line for advancement. Indeed, Blaney and the team have had an amazing season considering Blaney and his crew chief Jeremy Bullins are just in their second full season in NASCAR’s elite division. And the Wood Brothers are back on a full time basis for just the second year after running a limited schedule for the previous seven seasons. They scored a win at Pocono, Blaney’s first and the Woods’ 99th, a pole at Kansas, Blaney’s first and the team’s 117th. So far this season, they have four top-five and 14 top-10 finishes and 290 laps led. They’ve held their own against the Cup circuit’s elite teams during the eight playoff races to date. As in most years, the playoff participants have been at their best. “You’ve got to give credit where it’s due,” Wood said. “The teams headed to the championship round have really stepped up their performance,” Wood said. “And Ryan and Jeremy and all of our team members have done the same. Heading into this weekend at Phoenix, Blaney has three Cup starts on the one-mile oval in the Arizona desert. He has two top-10s there, and an average finish of 13.7, but he has a runner-up finish there in the Xfinity Series earlier this year and two top-fives in three Camping World Truck Series starts. For Sunday’s race, the blue and white colors of SKF will be on the hood, while Quick Lane Tire & Auto Center will be on the quarter panels. SKF was a primary sponsor for the Wood Brothers in two races last season and has been a long-time supporter of motorsports, including a relationship with Wood Brothers’ technical partner, Team Penske. SKF is a leading global supplier of bearings, seals, mechatronics, lubrication systems, and services. The company is represented in more than 130 countries and has around 17,000 distributor locations worldwide. Qualifying for the Can-Am 500 is set for Friday at 4:45 p.m. (6:45 p.m. Eastern Time), and Sunday’s 312-lap race is scheduled to start just after 12:30 p.m. (2:30 Eastern) with TV coverage on NBC.